Lock in a great price for Arrecife Gran Hotel & Spa – rated 8.7 by recent guests! Everything else. Room was a good size with a good view. Views from the pool deck on the 2nd floor and its 2 restaurants on the 17th floor were really nice. Breakfast buffet was one of the best I've had in Europe. Staff was very warm and welcoming. I don't think the hotel advertised that it had a large garage in it's basement and parking was reasonable (8 Euros per day). Rooms very comfortable, excellent views, nice staff. Hotel very clean. My second time to stay at this amazing 5* hotel. 5* Staff & Management. 5 Star Accommodation. 5* Facilities.5* Location. 5* Food. 5* Drinks. 5 Hospitality. Will most definately be returning. 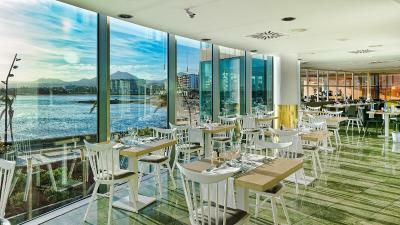 Thank You Gran Hotel Arrecife we had an amazing guest experience. Room was luxurious. Spa was luxurious. But if I had booked directly with the hotel , then use of Spa would have been free instead of costing 20 euro per session....and the manager was extremely rude when I attempted to negotiate free use of the Spa since I intended staying there three times per year! The staff were excellent. They were friendly, informative and helpful. The rooms (we were on the 13th floor) were spacious with excellent views across Arrecife. They were clean and well-maintained, and the food (both breakfast and dinner) was of a very high standard. Well appointed accommodations. Great pool deck and bar. Lovely beach next door. Pleasant and attentive staff. Staff - Everyone was really helpful. Breakfast - Good range of food, try and get down before 9 because it gets busy Pool and Bar - Was rarely busy, drinks in the 3.50e - 4.00e range. Everything was amazing. The hotel facilities are great. Architecture was amazing. Food was so good. View from the top floor is to die for. Staffs were very friendly and helpful. Breakfast and dinner were great. Hotel in a fantastic location, next to the beach, and only 15 mins from the airport, with brilliant views. Staff friendly. 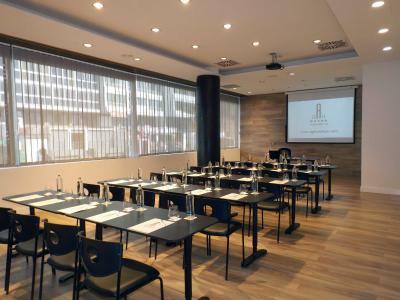 Arrecife Gran Hotel & Spa This rating is a reflection of how the property compares to the industry standard when it comes to price, facilities and services available. It's based on a self-evaluation by the property. Use this rating to help choose your stay! 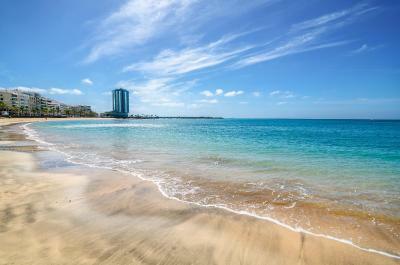 The Arrecife Gran Hotel & Spa is next to Arrecife’s El Reducto Beach, on the island of Lanzarote. 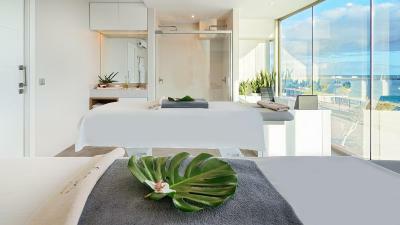 This 5-star hotel features a spa, indoor pool, free Wi-Fi and panoramic views. The hotel’s spacious, modern rooms feature hardwood floors and large windows. Each room includes a minibar and air conditioning. 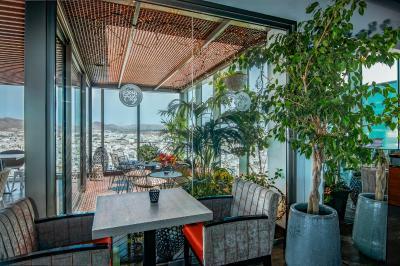 Some rooms offer city or beach views. Available for a fee, the hotel’s spa includes a hot tub, Turkish bath and sauna. 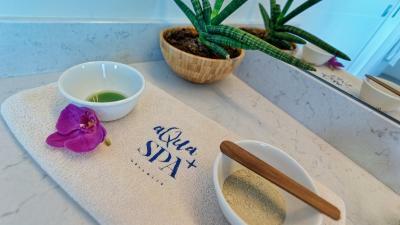 Massages and other treatments can be arranged. 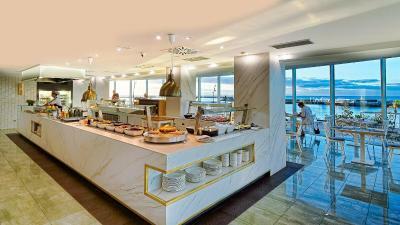 Guests can enjoy Mediterranean and international cuisine in the Gran Hotel’s elegant restaurant. 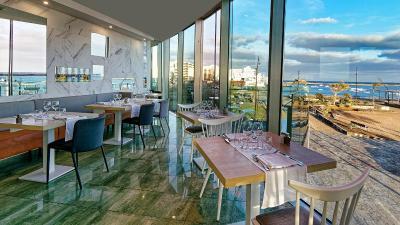 This sit-down restaurant is on the 17th floor and offers spectacular views of the sea. 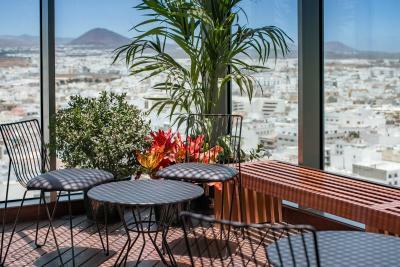 The hotel also has several bars, including one on the roof terrace. 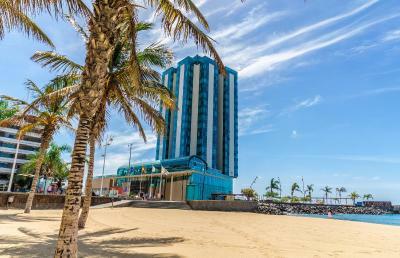 The tallest building on the island, the hotel is in a great location in central Arrecife. Lanzarote Airport is less than 10 minutes away by car. 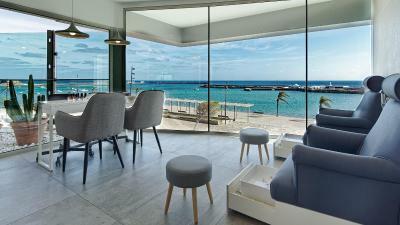 When would you like to stay at Arrecife Gran Hotel & Spa? The spacious, modern room offers sea views. It has hardwood floors and large windows, and includes free Wi-Fi, a minibar and air conditioning. 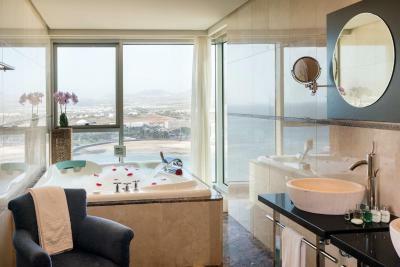 The spacious, modern suite features a separate lounge and wonderful sea views. It has hardwood floors and large windows which let in lots of natural light. It includes free Wi-Fi, a minibar, a safe and air conditioning, and has 2 single beds which can be joined together. The spacious, modern room features hardwood floors and large windows with views of the city. It includes free Wi-Fi, a minibar and air conditioning. This suite features a Nespresso coffee machine with coffee capsules which are refilled daily. There is also a mini-bar with beer, wine, soft drinks, juice and water. A bathrobe and slippers are provided. 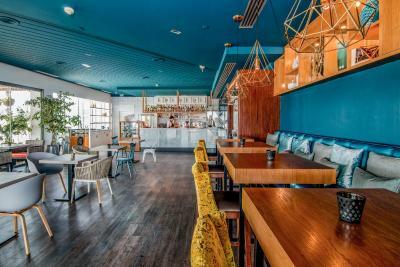 -Entrance to the VIP Lounge located on the first floor with exclusive Bar self-service (including wine, beer, coffee, soft drinks, juice, water, pastries and fruit). -National and international press . -PC with printer and Internet access . 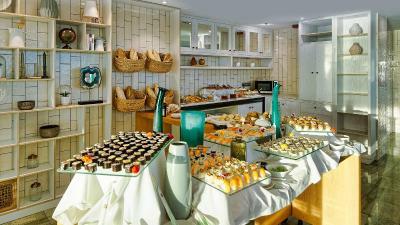 -Breakfast : Exclusive area for breakfast with tea and coffee, and a selection of omelets and eggs served at the table. 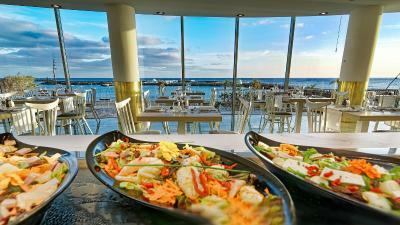 -Dinner: to choose from a buffet dinner or the à la carte Restaurant Altamar. -Daily spa circuit included, and 25 % discount on treatments and massages. This double room has a mini-bar, flat-screen TV and bathrobe. 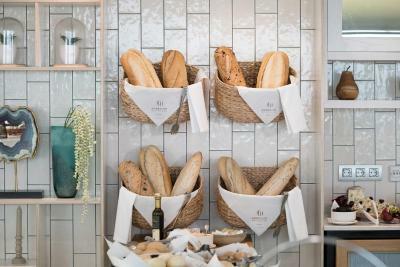 House Rules Arrecife Gran Hotel & Spa takes special requests – add in the next step! Arrecife Gran Hotel &amp; Spa accepts these cards and reserves the right to temporarily hold an amount prior to arrival. Arrecife Gran Hotel & Spa accepts these cards and reserves the right to temporarily hold an amount prior to arrival. Please inform Arrecife Gran Hotel & Spa of your expected arrival time in advance. You can use the Special Requests box when booking, or contact the property directly using the contact details in your confirmation. Portions at some of their restaurants were a little small. I thought I would get one free visit to the spa, but had to pay extra for that facility. Sea view room,comfy bed,friendly staff,buffet restaurant lots of food choices. Two single beds instead of a double bed. Slow and small lifts. No iron in the room. Good food variety at breakfast. Fresh orange juice. Hotel close to the beach. Big and bright room. Great views from the room and at breakfast. Cheap parking. Live music in the hotel restaurant. The entertainment was good but could have been on for longer. We liked the violinist. Missed the singer as she finished at 9:30pm just as we arrived after dinner. The hotel need immediately a make over. It‘s such a nice hotel but the outfits is no longer fitting in this time and reduce to 4 stars. There is a space for improvement. The hotel have a good location. The panoramic windows allow a fantastic view. Open space rooms. We appreciate that after a complain the manager have made a meeting with us and clarified the situation. Unfortunately one of three lifts was out of order and it sometimes took up to five minutes for one of the others to arrive only for it to be filled with staff which was very disappointing for a hotel of this standard. The location of the hotel is truly amazing and so was the view from our suite! We also really liked the breakfast buffet! It is a hotel without a soul, without atmosphere, without charm. Just one of these big and anonymous hotels that can be found anywhere in the world. The room is good, everything you need is there. But again here: no charm, no warmth, no atmosphere. The breakfast was so crowded, I did not like this mass tourism atmosphere. If I book a 5* hotel I definitely expect exclusivity. But this hotel is not exclusive as it is frequented by mass tourism. People staying here book cheap rates through tour operators, and the clientèle looks as you usually find it in a 3* hotel. I booked this hotel because I am used to style and elegance. But what I found here was a cheap atmosphere that had nothing to do with a 5* hotel. In the center of Arrecife. Nice view from the rooms. Staff was very friendly, nice and helpful. Garage is a big plus. There was a confusion with our booking on check in, I upgraded and the hotel were not happy to honur the price. Very disappoined as took nearly 2 hours to check in with calling booking back and forth. Not the nest start to the holiday but the hotel, facilities made up for the terrible start! The breakfast was the best Ive had abroad! Also stunning views and staff were friendly. The only negative for us, was the fact that you had to get coffee out of a machine! With 5 star, We feel ground coffee should be served to you at the breakfast table. Lovely hotel. We had a lovely suite with sea view. Very peaceful. Very clean and very good buffets. Breakfast was average, choices were good but quality of the ingredients disappointing particularly scrambled eggs, omelettes,pancakes and coffee was worst I've had in 5star hotel. For this reason we didnt even try eating in the restaurants at night, which is a shame because there is limited choice outside the hotel. The location and views were fantastic. The staff were very very good helpful and friendly. Pool and sun lounger area tiny so impossible to get a space.